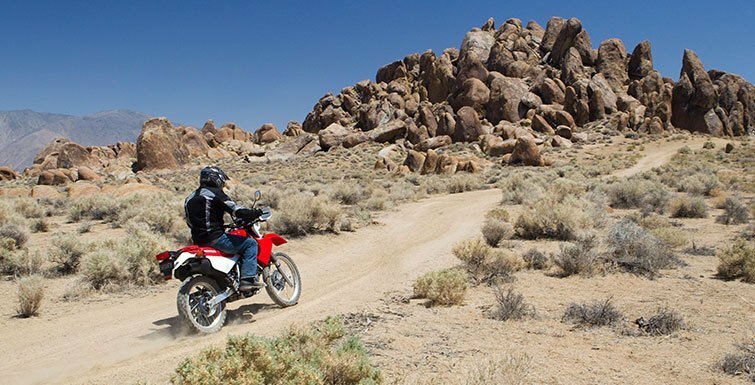 Let The Adventures Begin If you can get there by motorcycle, Honda’s do-it-all XR650L is the bike you can count on to take you there. Dirt or street, freeway or trail, mountains or desert, to work every day or to someplace where the phone never rings on the weekend. It’s one of the most versatile vehicles on the planet—and it’s a bargain to boot. The 644cc single-cylinder engine is air-cooled for simplicity, and offers legendary reliability, even under harsh conditions. Electric starting means getting underway is a snap, and an integral engine counterbalance means it runs smooth. 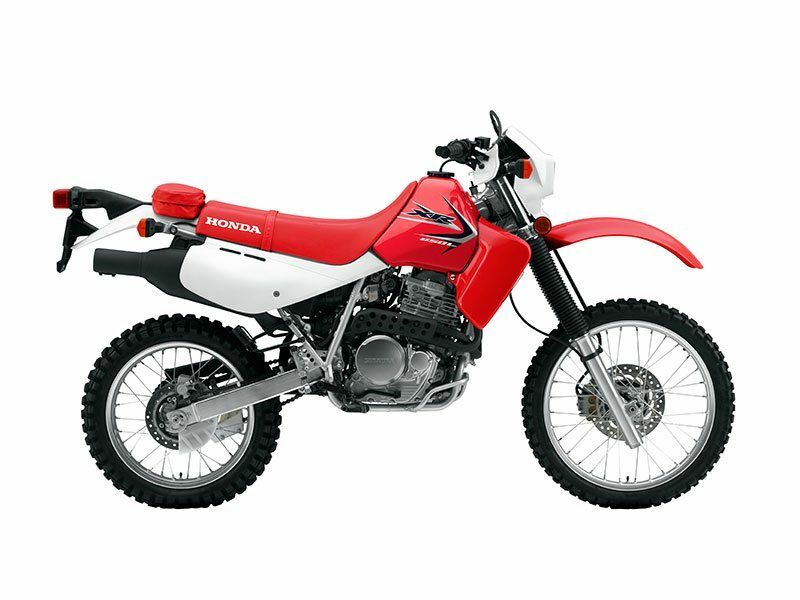 Off-road it has the power, suspension and durability a dirt rider demands. On-road its light overall weight and excellent fuel efficiency make it the perfect commuter. 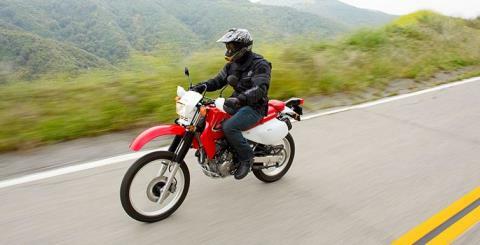 Both practical and fun, the XR650L has developed a loyal following, and it’s easy to see why. 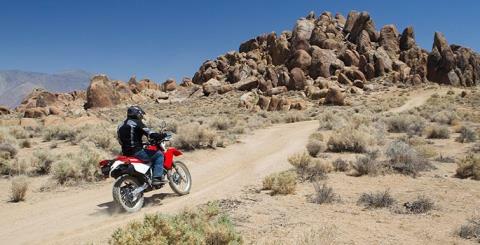 If you’re looking for one bike that can really introduce you to new worlds, look no further than the XR650L. 18-inch rear wheel gives you a better overall ride and more sidewall protection against flats, and still offers a wide choice of on- or off-road tires. The 21-inch front wheel gives you a wide choice of tire selection for different riding conditions. Front- and rear-disc brakes provide superior stopping power. Both front and rear disc rotors are drilled for lightness and better wet-weather performance. Adventure bikes are all the rage today, but Honda’s XR650L has the dirt-bike cred that lets it ride circles around some of the other bikes out there. 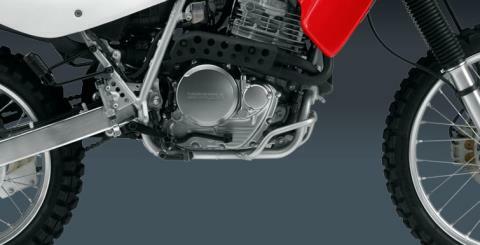 And the features that make the XR650L such a competent machine in the dirt make it a great choice for the street, too. 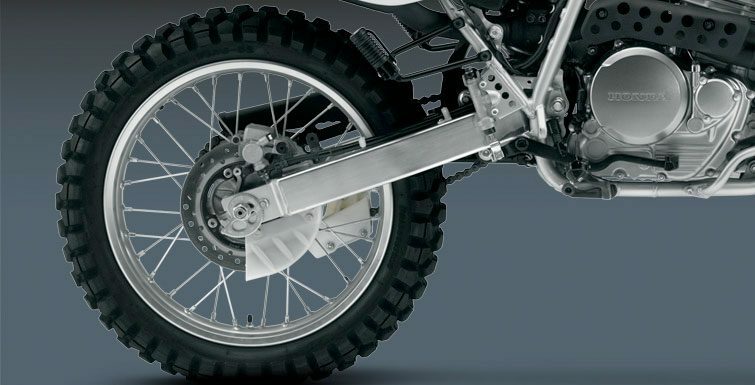 The semi-double-cradle steel frame, 43mm Showa® cartridge fork with 16-position compression damping adjustability and a lightweight aluminum box-section swingarm with quick-detach rear wheel make it a great dirtbike, while front- and rear-disc brakes, push-button electric starter, compact speedometer, steel fuel tank and superior fuel efficiency make it an excellent street machine. 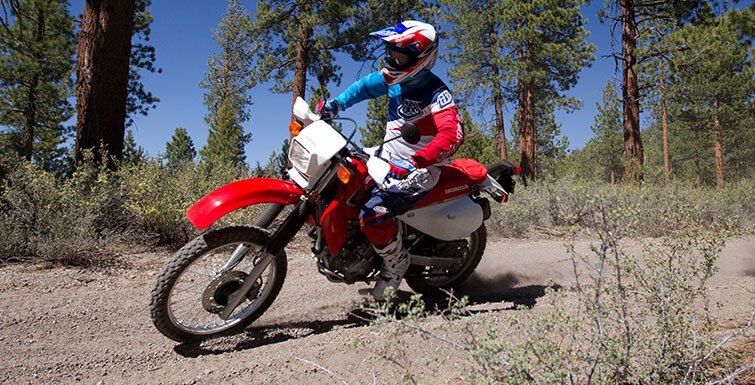 Turn the key and push the button—that’s all it takes to get your XR650L going. The electric starter takes all the drama out of restarting off-road, or getting underway on a cold morning or after the bike’s been sitting all week. 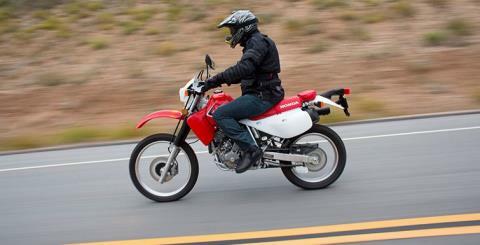 Four-stroke single-cylinder engine offers good fuel efficiency and a wide powerband. 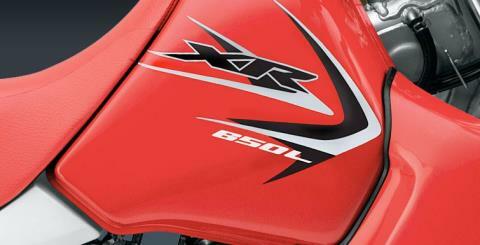 The XR650L’s proven powerplant requires very little maintenance. With a full 11.6 inches of travel, the air-adjustable 43mm fork also offers 16-position compression damping adjustability, letting you fine-tune it to deal with the bumps of off-road riding. With a passenger grab strap, folding passenger pegs, a long MX-style seat and plenty of Honda power, the XR650L lets you carry a passenger with ease. No maintenance hassles here, even in case of an off-road tip over. The sealed battery has plenty of cranking power for the electric starter, and is well protected from the vibrations of off-road riding. 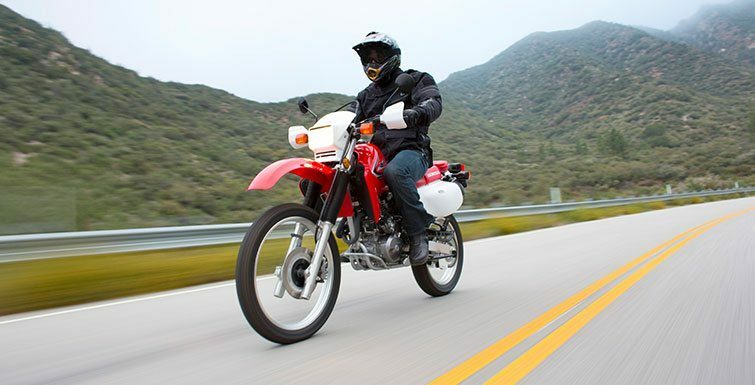 The XR650L is fully equipped for the street: horn, turn signals, license-plate light, mirrors, speedometer and more. There’s even a grab strap and footpegs for a passenger. 52 MPG - Miles per gallon values are calculated estimates of fuel consumed during laboratory exhaust emissions tests specified by the EPA, not during on road riding. Use for comparison purposes only. 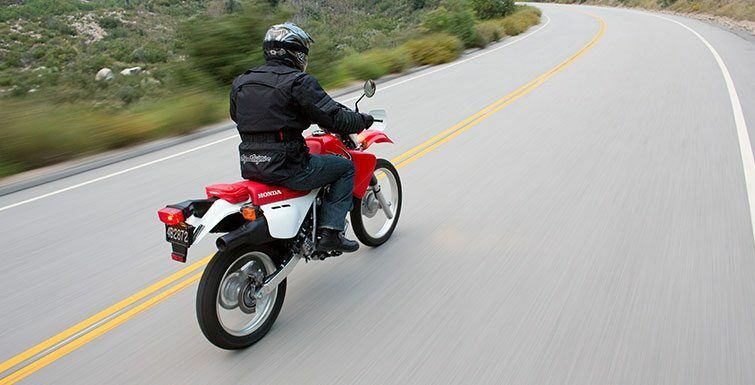 Your actual mileage will vary depending on how you ride and maintain your vehicle, weather, road conditions, tire pressure, cargo and accessories, rider and passenger weight, and other factors.